It all started 16 years ago, against the same team that will be coming to Foxboro this Sunday. 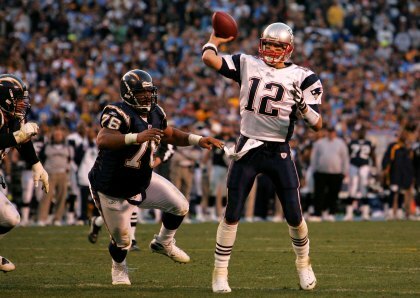 The New England Patriots will take on the Chargers for a Week 8 matchup, and it just so happens that it was that same team, back in 2001, that helped put Patriots’ quarterback Tom Brady on the map. Throughout his career, Brady has executed 52-game-winning drives after being down or tied in the fourth quarter, and Oct. 14, 2001 was when it all began. It was Tom Brady vs. Doug Flutie in old Foxboro Stadium. In only his third career start, Brady led the Patriots back from a 26-16 fourth-quarter deficit to a 29-26 win in overtime. Down by 10 with 8:48 to go in the game, the young New England quarterback was able to lead the team to a field goal, touchdown and another field goal over the next three drives. These three scoring series included a 15-play, 69-yard drive to set up a 23-yard Adam Vinatieri field goal with 3:31 left. Then after a strong defensive stop, Brady had the ball back and it was time to tie the game. After deep balls down the field to Troy Brown and David Patten, Brady connected with Jermaine Wiggins for a 3-yard touchdown to force overtime. Brady threw Patten’s way again in overtime when the Chargers committed a 37-yard pass interference penalty. This helped set up a 44-yard Vinatieri game-winning field goal and helped set the stage for Brady’s legendary career. Late Pro Football Hall of Fame linebacker Junior Seau of the Chargers had high remarks and admiration for the Patriots’ rising star that day. And 16 years later, we have that same Brady with the same drive, same passion and same love for the game.